Over a decade of brilliant creativity for the world's favourite broadcaster. The BBC is a long standing client of Firedog and first worked with us back in 2005. We have delivered brand and digital creativity through our membership on the BBC's digital roster. Our services to the BBC included strategic consultancy, brand creation, visual identity, print and digital advertising, animation, communications and print design. 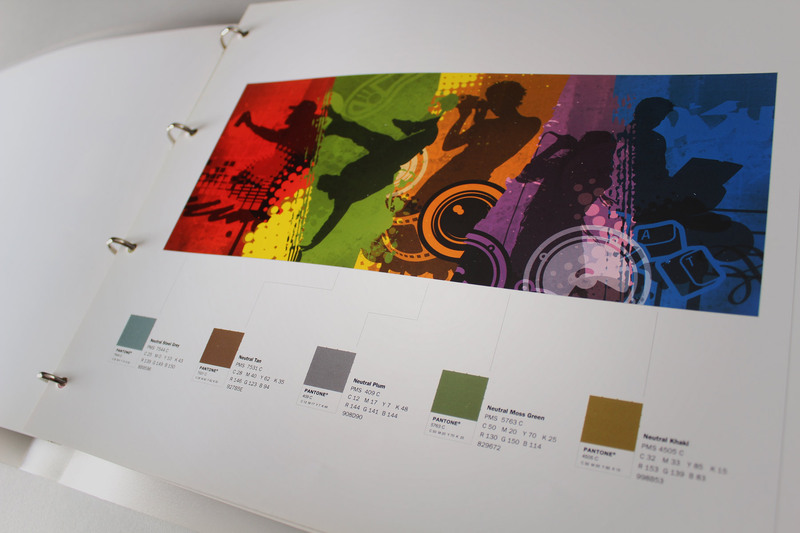 The primary brand application contained a strong Blast wordmark rendered in a suite of hifi colours. 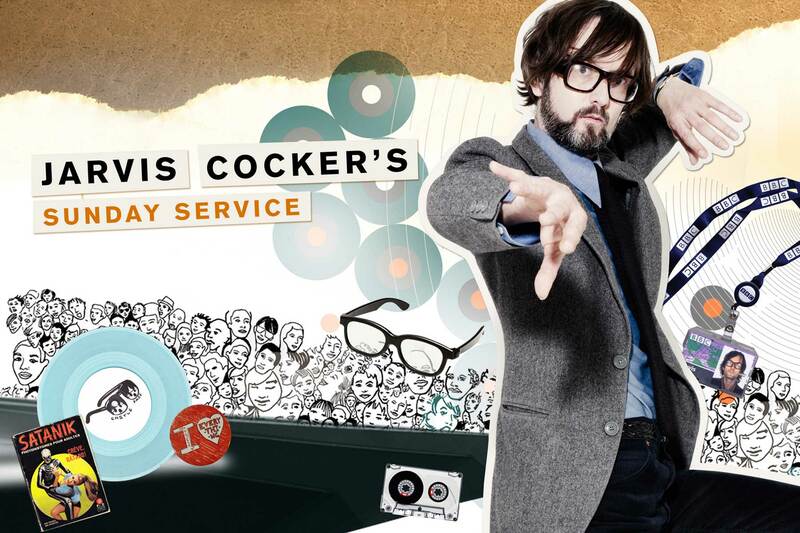 Whilst the look and feel consistantly represented the overall 6music branding, each show page carried its own spirit and message through the careful selection of graphic bric-a-brac. We were invited to pitch alongside four other creative agencies. We set about creating ideas that were cerebral and individual. All our ideas worked off the belief that whilst the 6music listeners varied their tastes in genres, they could all be seen to be independent thinkers. 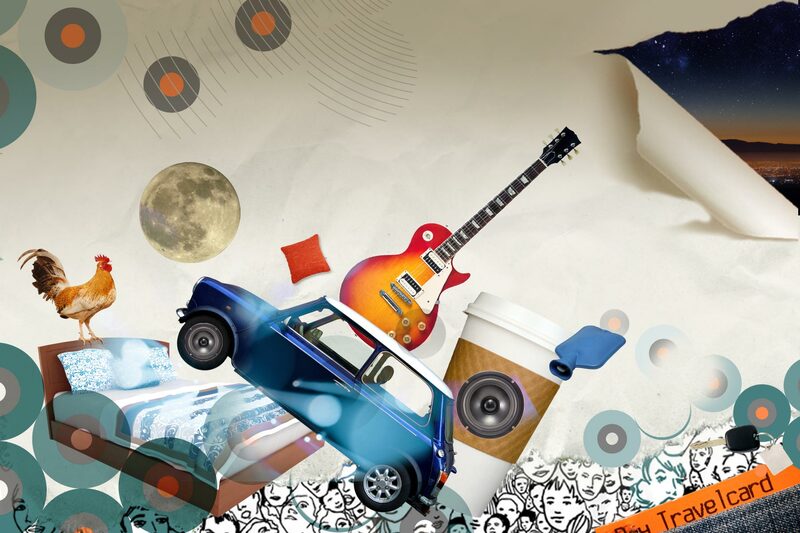 The concept which won the pitch was formed by combining portraits of the presenters with found objects. Inducing an individual and often comedic result. The deliverables also included a set of generic templates so that the BBC team could add new shows. Also, this template helped for guest DJs, collaborations or other special events. Each show page carries the personality and style of the presenter across to the audience. 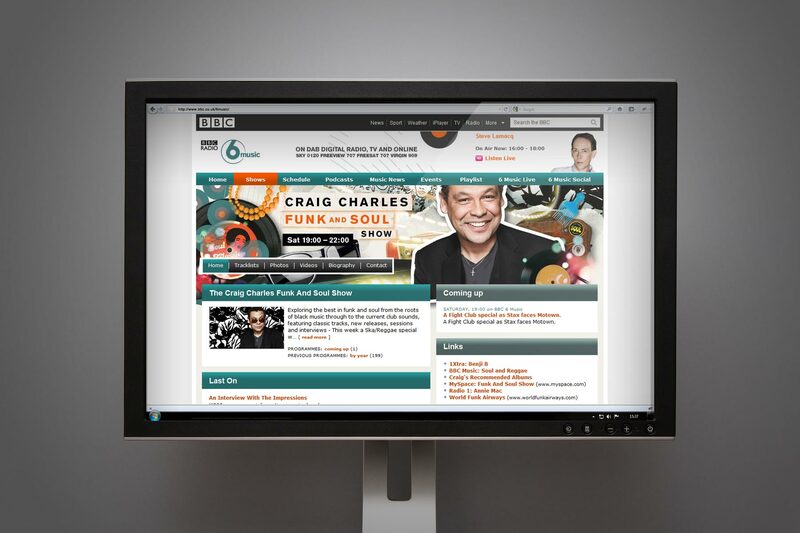 The BBC team chose to the build of the 6music site across a number of suppliers - Our creative digital branding slotted neatly within the new interface language. 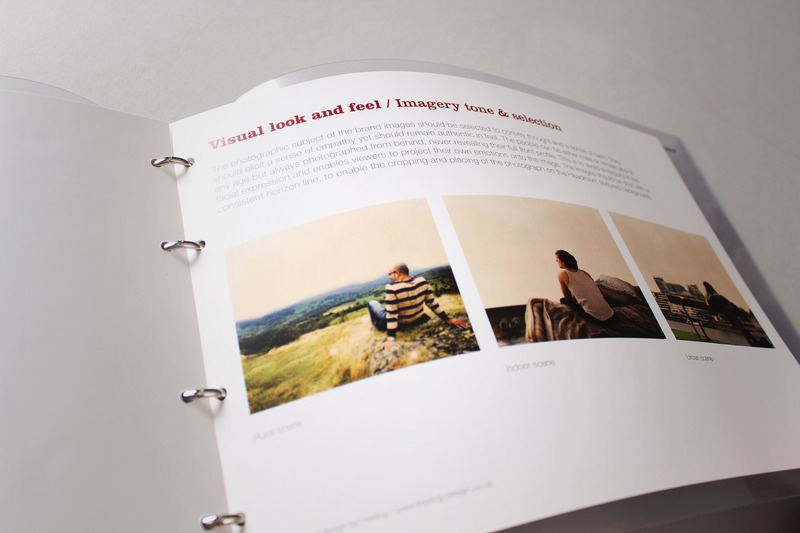 The presenters pages were unified via the consistant quality of the portraiture, the community illlustration and the use of abstract light wave imagery. 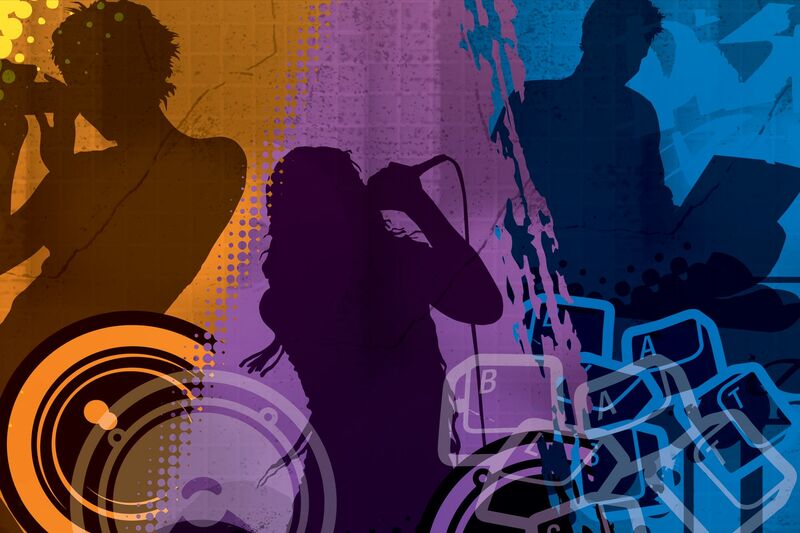 The subtle use of colour and complexity hints at the presenter style of music and show. The show names are locked up into panels falling within the show graphics - Keeping vital information on a legible background. 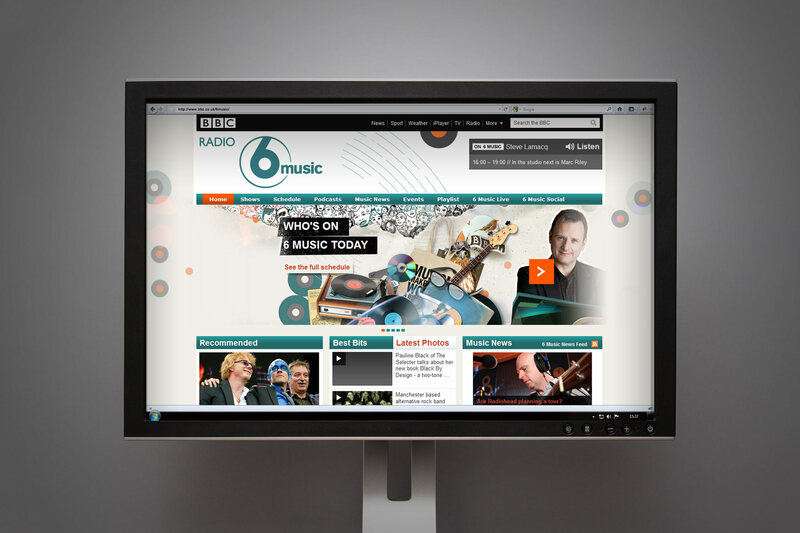 The BBC team have been able to take the brand toolkit and have developed further pages, such as the 6music home page here. The target audience engaged both in workshops and learning environments and also utilised the supporting online creative social network. In our background research we explored the audiences inspirations in media and defined our brand around established patterns. We created the brand in such a way that it has the ability to change its environment according to the will of the user. 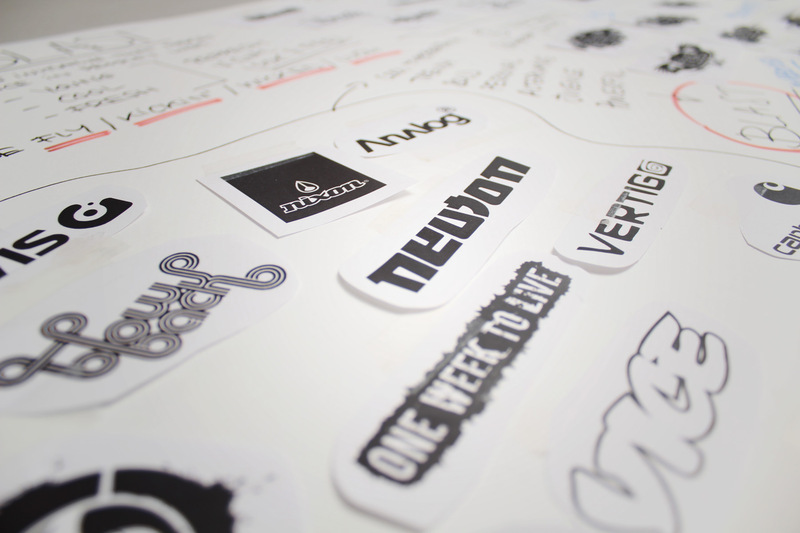 We went as far as uploading an editable brand template - So that the creative audience could make the identity theirs. The supporting visual identity behind the brand featured a series of composite and seperate illustrations around the five core creative disciplines. When combining the illustration assets together with layout devices, an instantly recognisable look and feel is created. We created all the brand messaging. The strapline encourages young people to have the confidence to turn their skills in producing creativity for real, as opposed to just a vision. 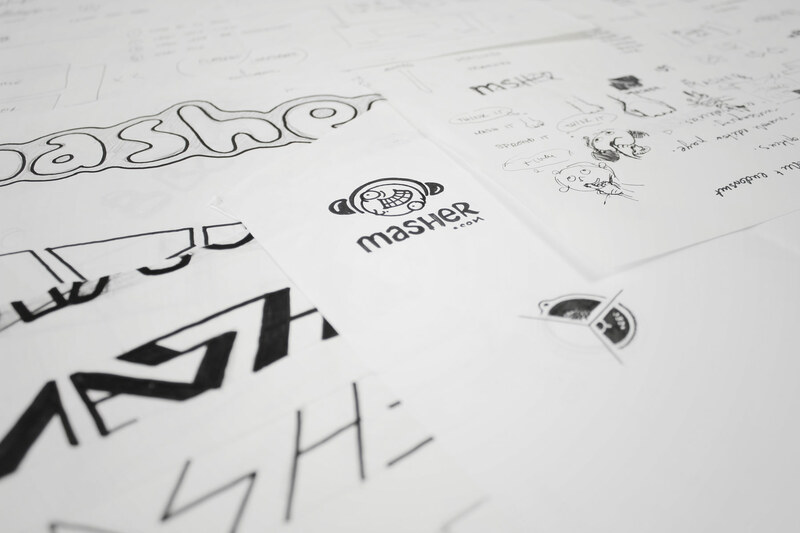 The brand graphic devices were created with an exceptionally freestyle framework. This generated a dynamic visual identity which did not look tired or dull. 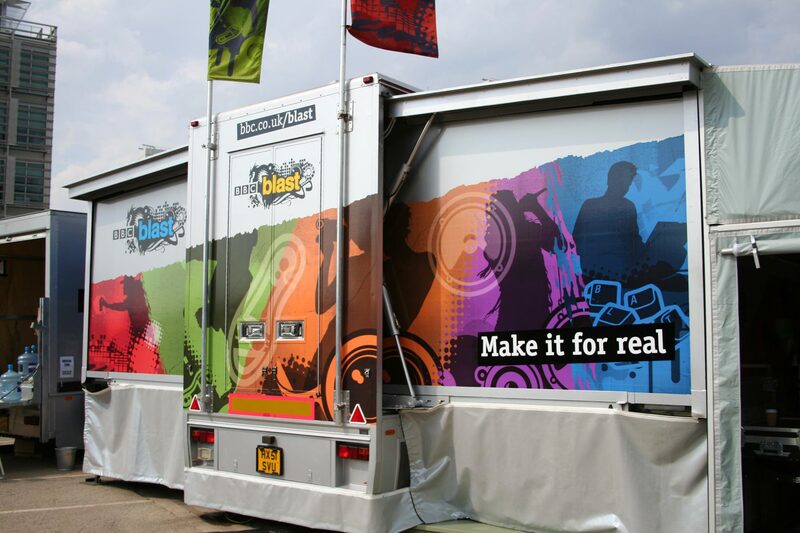 The online and brand media was greatly supported by a large amount of print merchandising, created for the Blast roadshow. A powerful application for the brand was a set of articulated trucks which toured the UK for a period of eight months, designed to bring creativity to the far reaches of the community. We created a number of branded illustrations, a punk inspired typographic feel and a harmonious suite of graphic devices. The project was completed with an extensive fifty page brand and spirit guide which aided the BBC internal staff in extending the brand into the future. The publication title weaves intrigue and sets up the story about to unfold. Max and Lara are a representation of adventurous young people and their ability to approach challenges with an open mind. 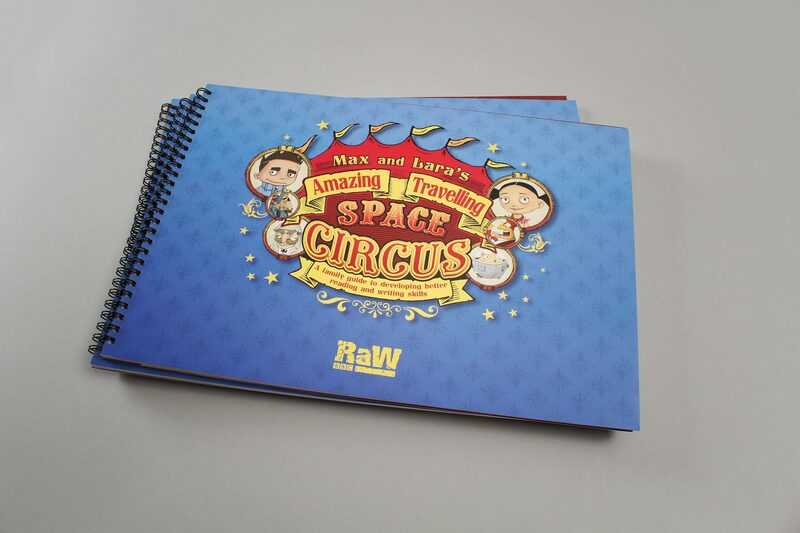 The graphic title area has been carefully crafted to convey a circus type feel - The overall size of the publication being a custom larger than A4 size, gives it an impressive impact. The concept of space circus allowed us to create a myriad of weird characters - Such as Kooloo the space hamster. The characters and story were sketched up loosely before being digitally illustrated and formed. This editorial device allowed the audience to fully engage with the stories little challenges. 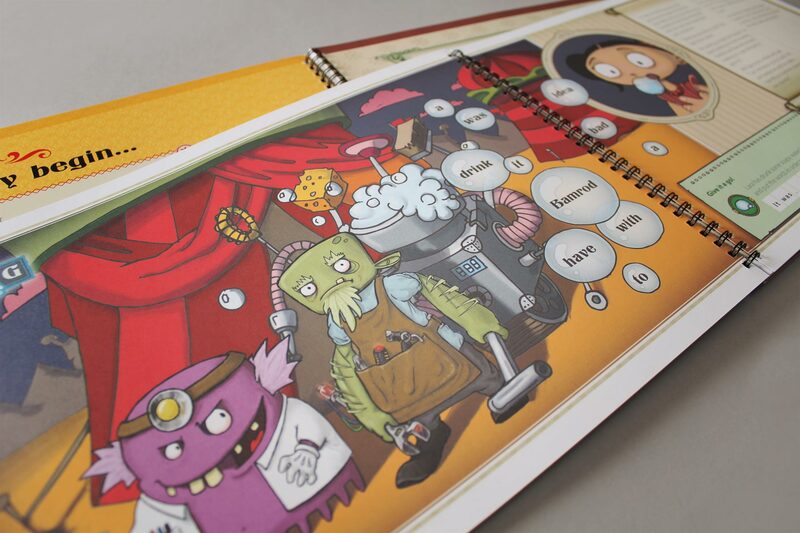 The learning remit is cleverly disguised within an immersive story-telling environment. A relatively tight family of typefaces and a layout grid held the chaotic content together. 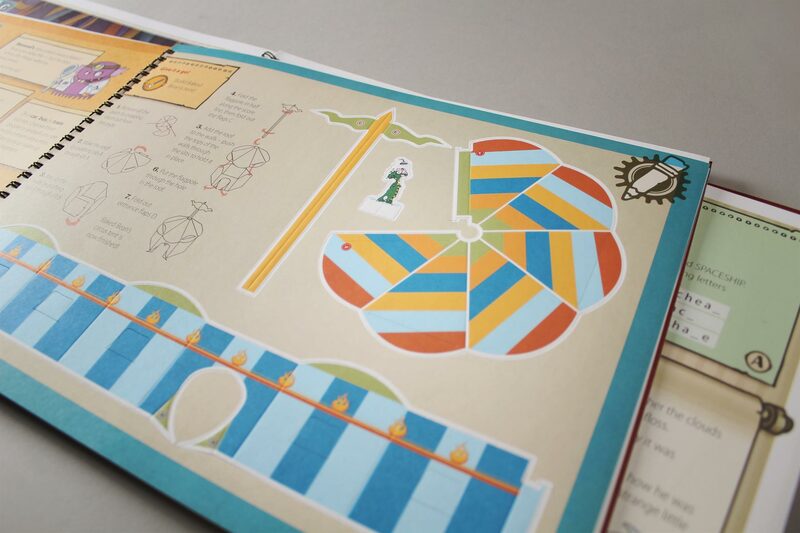 The book shipped with sticker sheets and a large poster where the readers could track their progress. 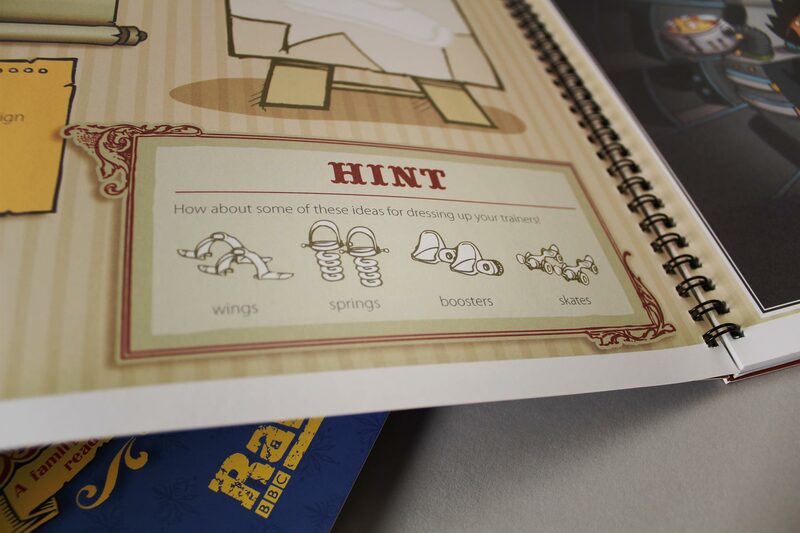 A second activity sheet allowed the young audience to build certain elements from the story. We got to grip with the theme of Mashing and sketched out ways in which this could be portrayed in a quirky and memorable way. Often we would venture into territory which may have been a little random. We wanted the brand to have a memorable type treatment, so we experimented with both hand cut and machined type. The next stage took our ideas and applied a somewhat more formal visual language. 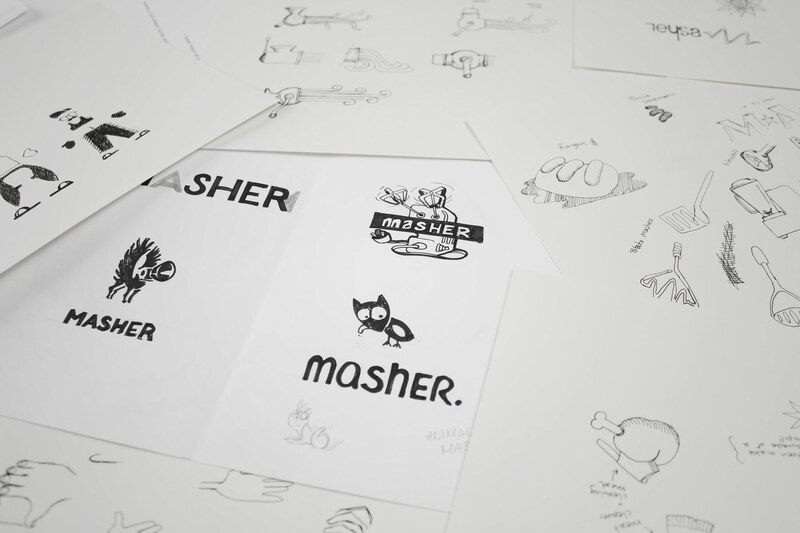 The Masher identity is inspired by the notion of dicing and slicing content - Hence the wordmark has been cut into numerous parts, a graphic representation of this idea. We also advised on the design of the software interface, creating a unique yet functional feel. The original look and feel used strong colour to convey the different functions behind the product. A person sits within a typical british landscape, the graphics indicating all the issues that may trouble the modern mind. The unique and simple graphic language ensures standout amongst an often frenetic marketing environment. 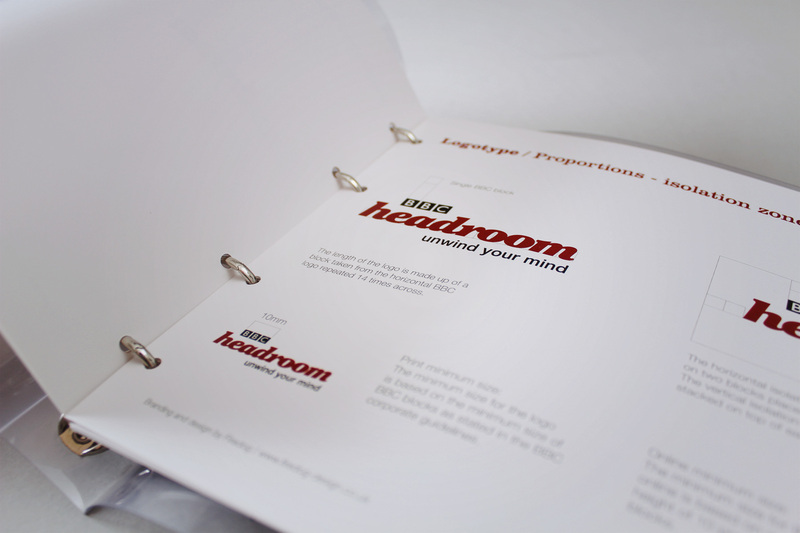 The headroom brand is rendered in a semi formal cut serif italic, which is accessible yet somewhat respected. Included in the project, a full set of guidelines enabled the internal BBC team to extend the project. The primary brand device ensured that the campaign and branding tied together successfully. The guidelines show the look and feel adapted to the online environment. 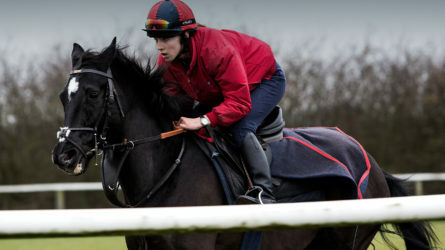 We allowed for a suite of imagery to support the brand communications. In order to break down the perceptions of online browsing, we used an island based freestyle user journey. This application shows the ten year old interface style. Research users were able to hop from subject to subject, browsing topics via selecting islands. Jumping on an island would bring up another set of surrounding islands. The journey feels as if one is moving laterally through the interface itself. This image shows the 15 year old interface. 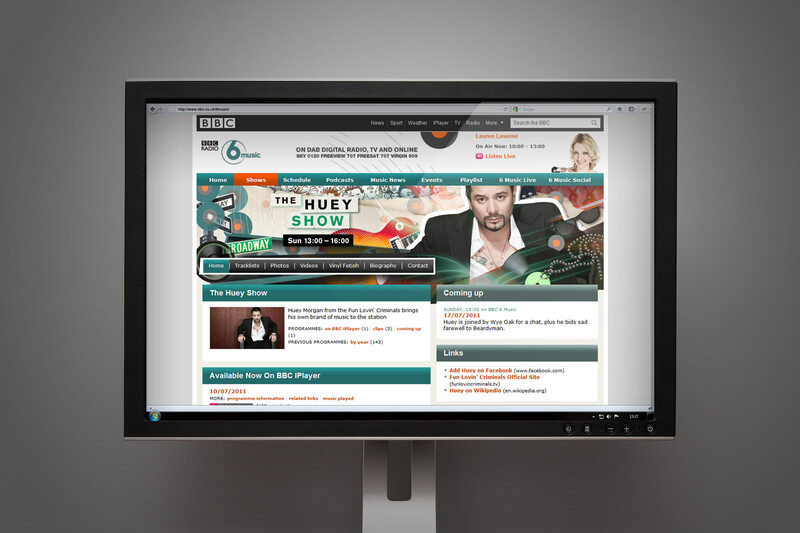 We were tasked by the BBC project team to make sure that the research stimuli did not feel like a website. 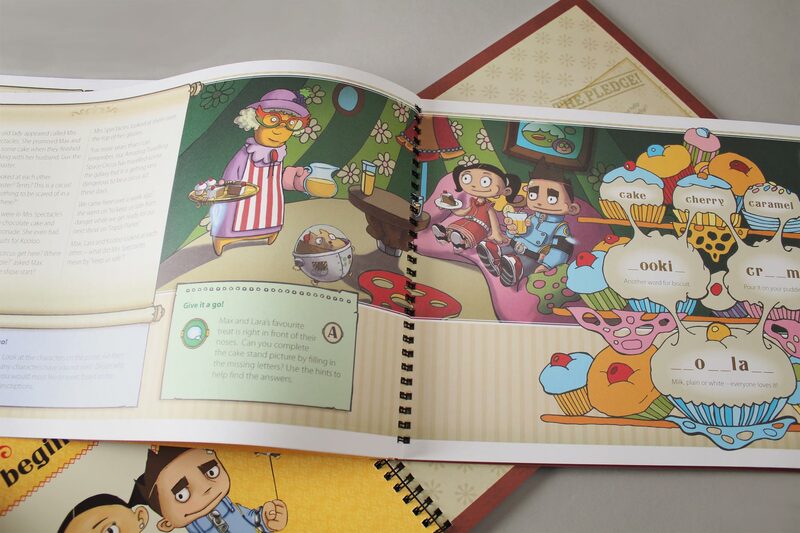 We designed three environments - This one is for the seven year old age group. 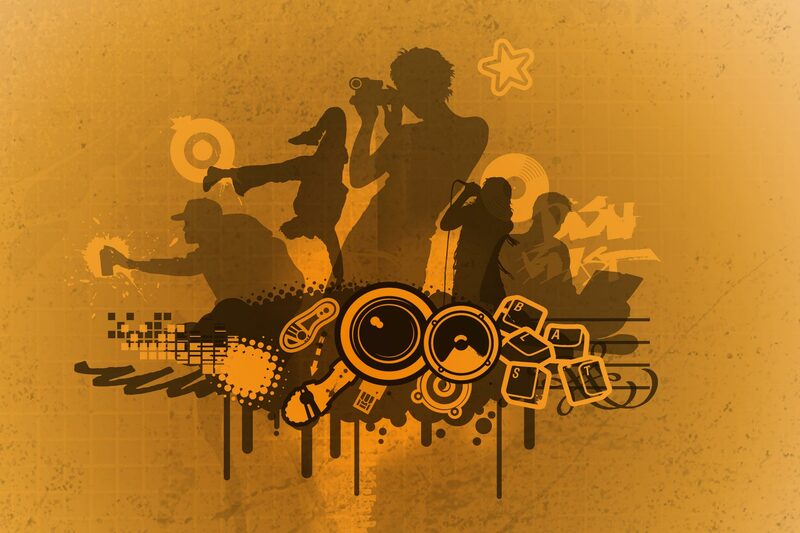 We provided assets for all creative disciplines - For example, dance within this image. 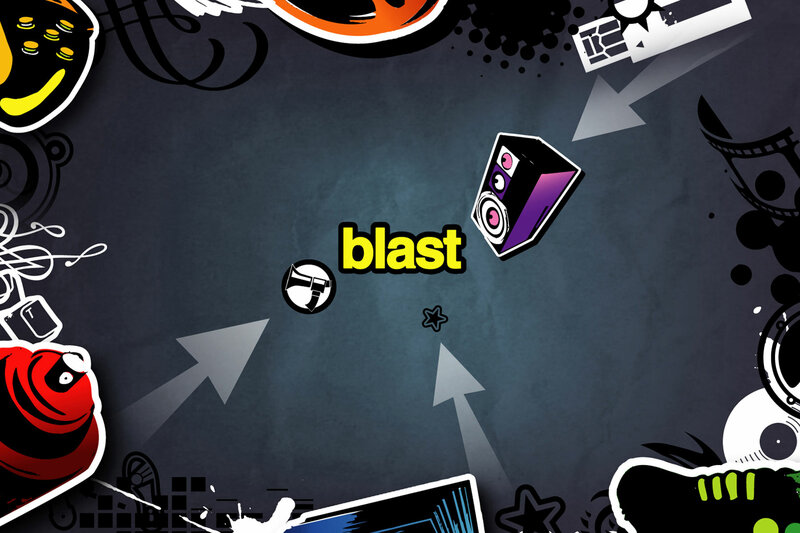 We also created assets for mobile and the Blast on Tour roadshow environment. The Blast communities are encouraged to tag their art and the assets are openly provided to all. The assets all follow the Blast look and feel, with primary shapes and bright supporting colours. We provided assets which helped capitalise on referral linking. Following the success of our work on BBC Blast, we were asked to provide a large suite of digital brand assets, which could be used across the audiences desktops and social networks. Here is a still from the animated screensaver. We have assisted the BBC in key creative projects providing strategic support, brand and visual identity and digital services. We have worked with a wide variety of departments, with a particularly large portion of our work being commissioned for the Radio, Music, Education and Learning divisions. Have a look below where we outline some of our key case studies. 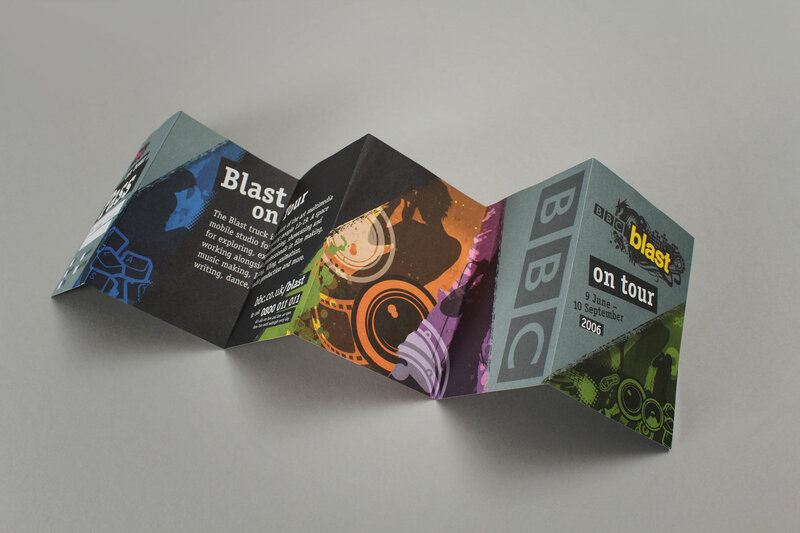 The visual identity was required to convey the breadth and depth of the music played on 6 Music and the individual flavours of the shows. Following a two stage creative pitch, BBC Radio 6 Music contracted Firedog in to work collaboratively with the interactive team to re-design and re-fresh the look and feel of the 30 individual online presenter show pages on bbc.co.uk/6music. The brief was to create new visual assets to reinforce and communicate each of the show personalities and brand values – developing stimulating, presenter relevant, creative header and footer assets to top and tail the show page content. 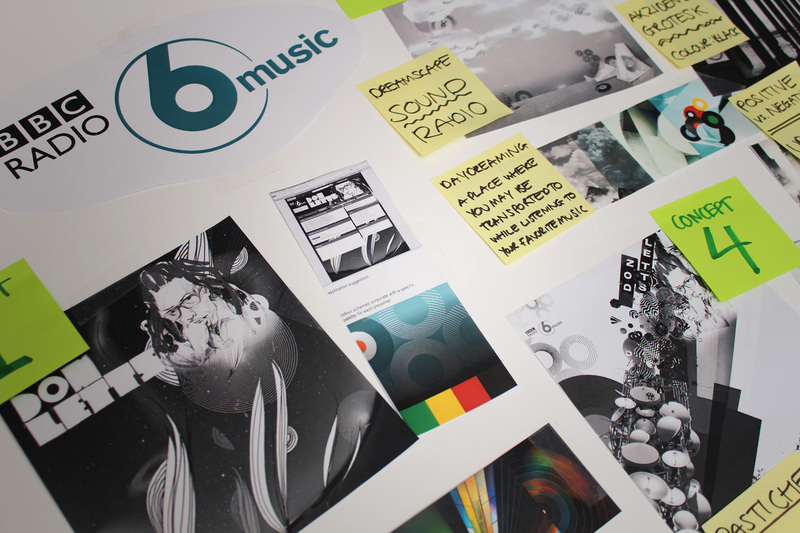 The new brand toolkit needed to consist of a visual design system to complement the existing 6 Music brand assets, but convey the breadth and depth of the music played on 6 Music and the individual flavours of the shows. Firedog decided the most authentic creative result would come from using image assets directly from the presenters themselves. We provided a consistent design concept that could be maintained across the suite of shows, that could also be suitably adapted to represent the individual presenters. Firedog developed a short questionnaire for the presenters – in order to gain an insight into the show themes, unique traits, representative abstract objects, mood, listener personalities and visual stimuli. Findings were used to direct the image selection for each presenter. Firedog decided the most authentic creative result would come from using image assets directly from the presenters themselves. Jarvis Cocker, for example, sent us a favourite book ‘English Cheeses of the North’. 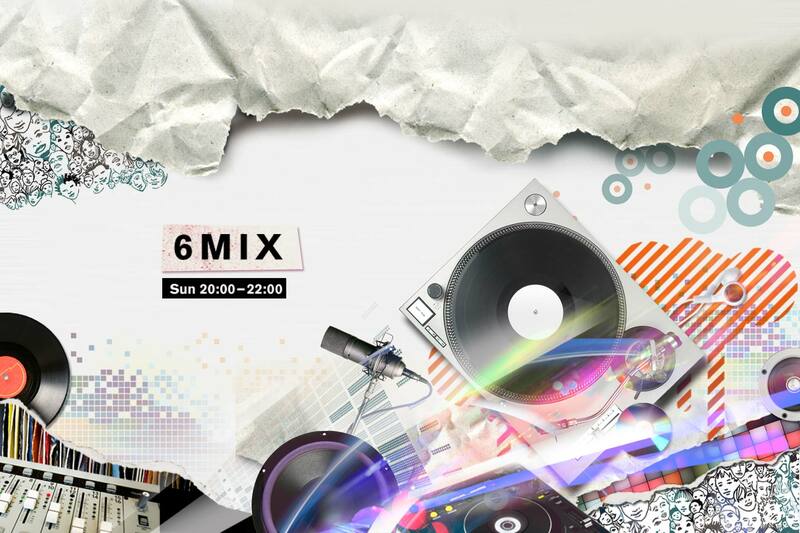 The supporting images were then integrated with the concept visual look and feel, BBC 6 Music brand assets, presenter shots, font styles, a community illustration (to represent the listeners) and dynamic light waves – the result being highly creative, stimulating visuals with a true reflection of the 6 Music show family of radio personalities. The visual identity rebrand helped elevate the channel during a very difficult time in its history. The project was undertaken at a very difficult time in the channels history – At a period where it was looking to be cut along with a host of other stations and initiatives. Thankfully, there was a large uproar from the greater 6music community. As the creative launched at the same time, it neatly dove-tailed into feeding the flames of resistance – via generating a great deal of interest and discussion online. The primary focus of the initiative is ‘Blast on Tour’ which features a large road bound studio offering digital and creative experiences to young people. 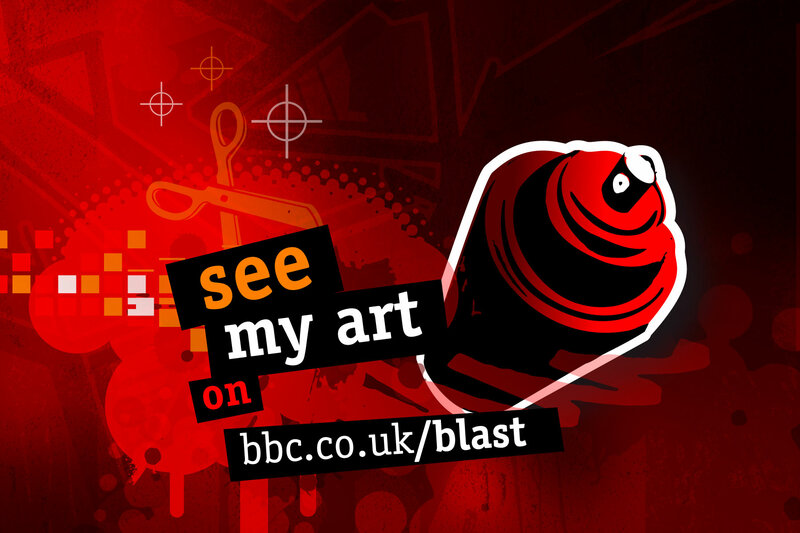 BBC Blast is a creative forum that aims to inspire and motivate young people in the UK to realise their talents in art, dance, film, music and writing. 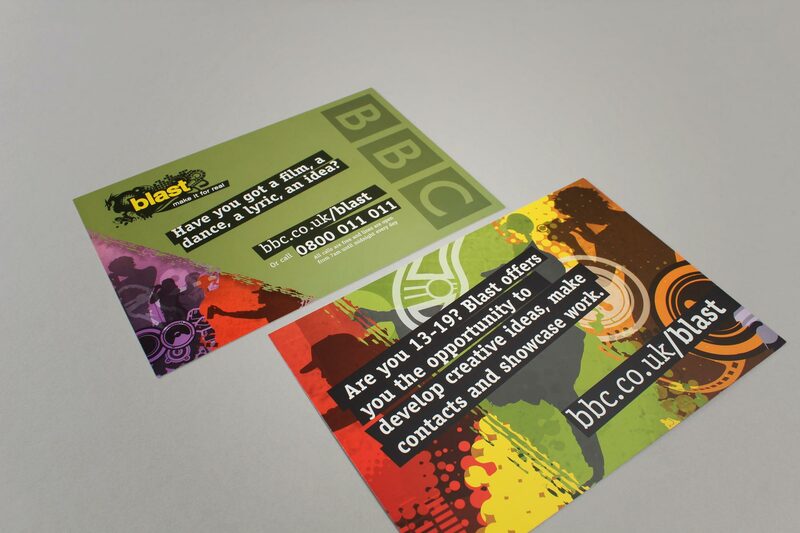 The initial Blast brand was a 3-year pilot that had achieved sufficient interest and support within the BBC for it to become a mainstream BBC Learning and Education brand. The primary focus of the initiative is ‘Blast on Tour’ which took to the road a mobile creative studio offering digital media and creative experiences to young people. It’s more than a large truck – think dream mobile workshop space crossed with a fully equipped media production studio, all with a high capacity uplink to the BBC studios. A brand that could not only adapt to anyone's sense of style, but also change with the times. 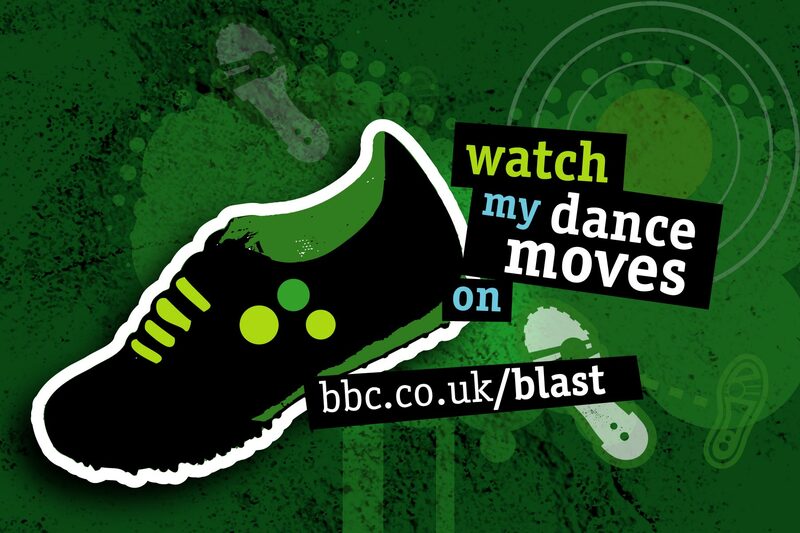 Firedog was awarded the contract to create the Blast brand for the BBC after a five-way creative pitch. 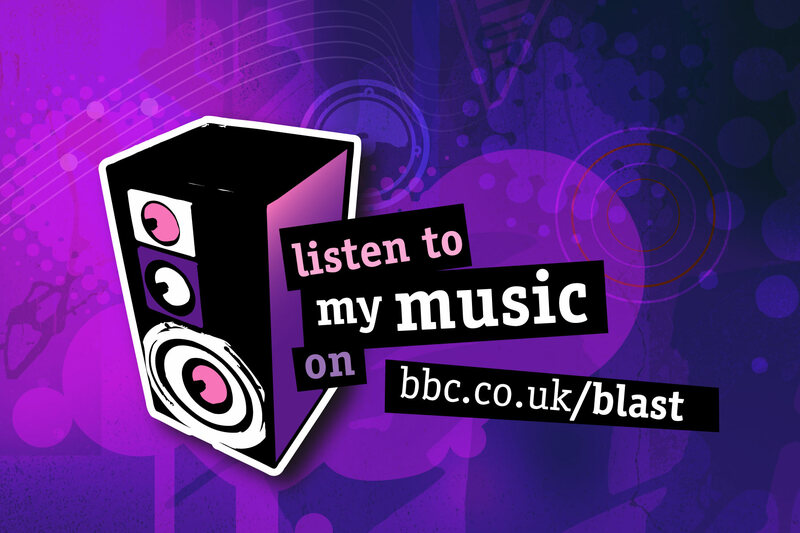 The challenge with BBC Blast was that it was essentially a brand that had evolved over a three year period and had, to the point when we started working on it, been controlled by the Blast youth panel. We felt that it would be dangerous for a London branding consultancy to descend upon the brand and reinvent everything according to their own house style. Our research indicated that young people are very much into personalising their experiences and are becoming resistant to demographic profiling that places them into a particular youth segment. From these strategic pointers, we realised that we would need to develop a brand that could not only adapt to anyone’s sense of style, but also change with the times – as to maintain its street credibility. We developed a “perimeter” illustration around the core brand, which will be able to be customised at will by the audience. 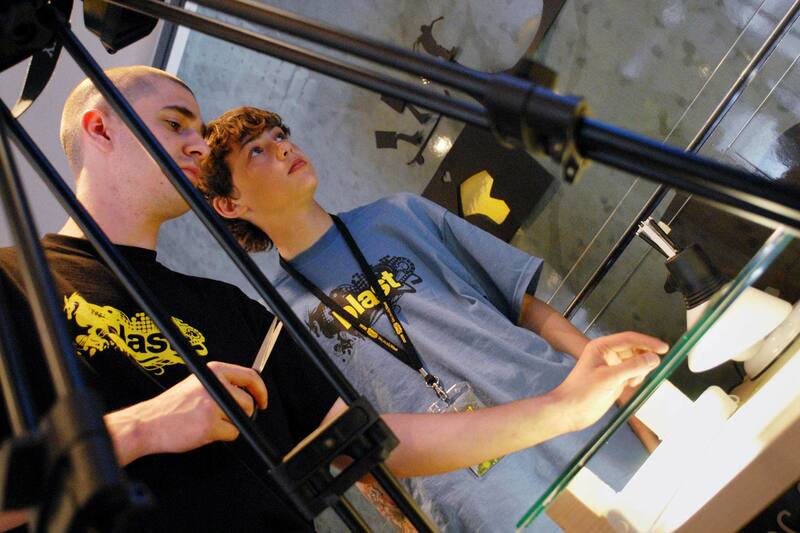 The teens are able to download a spacing template from the Blast site and literally create their own brand experience. Whilst this strategy raises obvious challenges for the Blast team, we believe that its real power lies in the future potential of the brand evolution process. 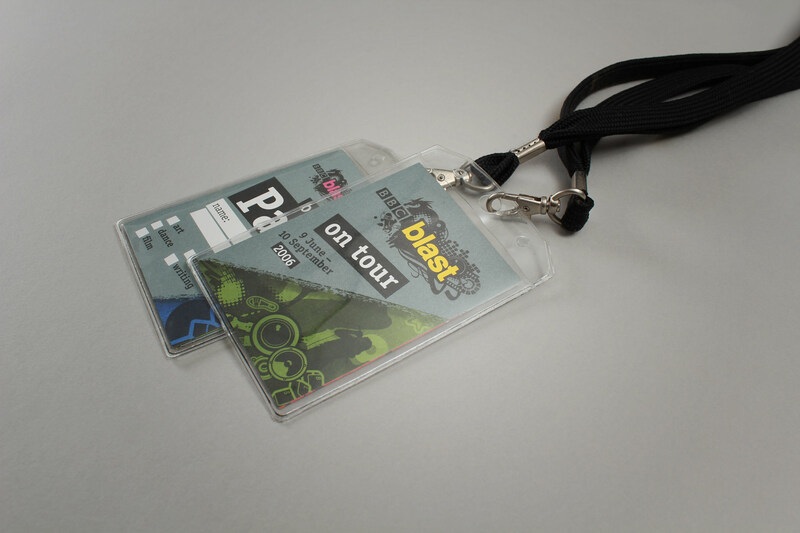 The Blast brand became a leading beacon for engaging with young creative youth around the UK. 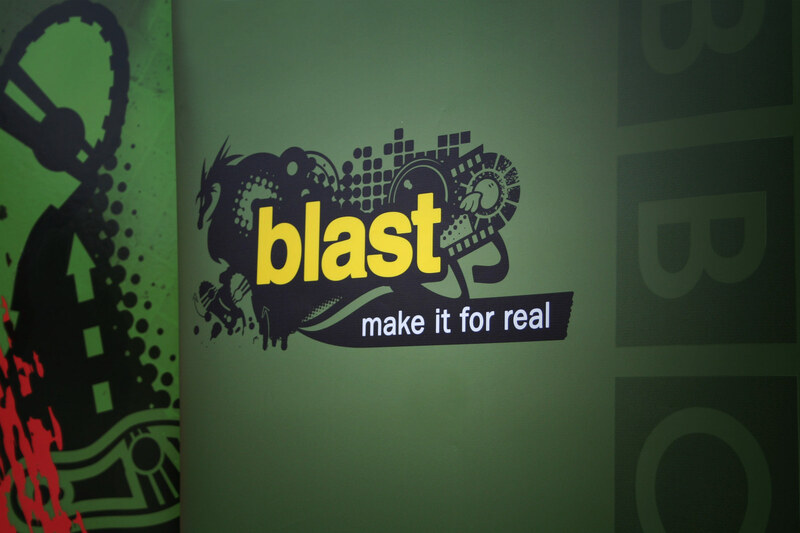 The Blast brand became a leading beacon for engaging with young creative youth around the UK. The brand subsequently extended from an online environment onto the television medium with a number of hosted creative festivals. Firedog needed to be responsible for the full brand creation remit, which extended to the following elements: Brand strategy / Key messages / Testing / Visual brand identity development / Brand guideline bible / Truck branding (including interior graphics) / Print, merchandising & promotional / Online brand (for interim & full launch website) / Motion graphics for TV, big screens and online / Mobile brand guidelines. 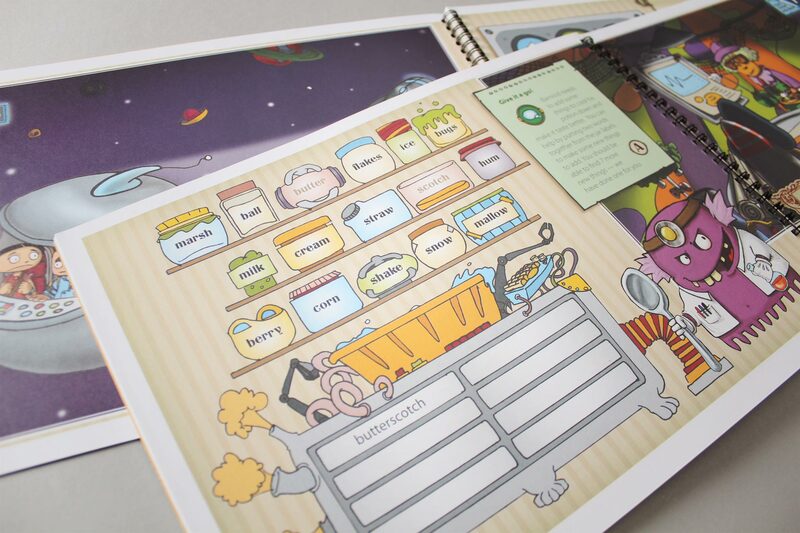 As part of the Parent Phase of the RaW initiative, the brief was to create a pack that would inspire and motivate non-reading parents to engage in storytelling, reading and writing with their children. The pack required a entertaining approach, with highly visual content, and full of creative ideas and activities for parents and children to do together. The ultimate goal was to create a fun and interactive experience. This was to be underpinned by a strong educational pedagogy to support the adult literacy objectives of the campaign. The ultimate goal was to create a fun and interactive experience that would give parents more confidence with storytelling and the written word, and enjoy getting involved with learning alongside their children. The pack is to be distributed for free via a television campaign, and through libraries and other RaW centres throughout the UK. 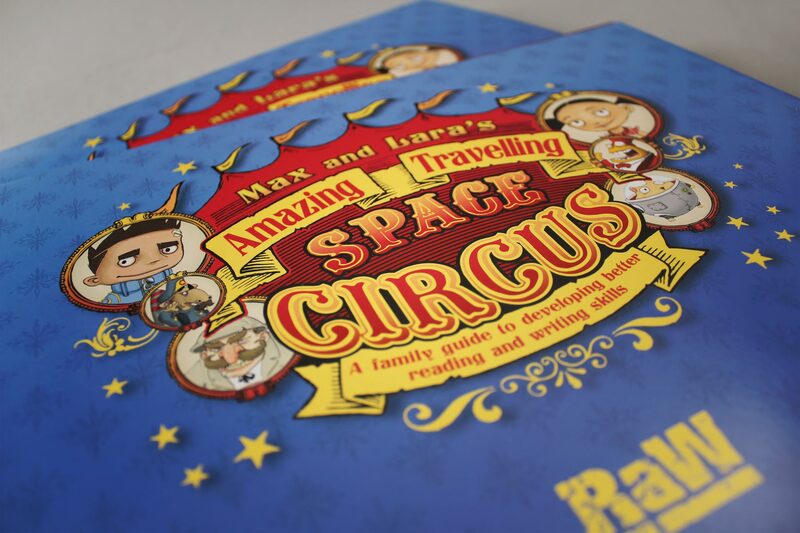 Firedog created a concept set in the fantastical world of ‘Max and Lara’s Amazing Travelling Space Circus,’ and developed a fully illustrated 44 page storytelling activity book. The story portrays the adventures of two young siblings, Max and Lara, as they unexpectedly land on a strange orange planet. They discover and befriend some strange creatures, and overcome a dangerous plot by the evil General R T Facts that threatens to destroy the space circus. The book is full of interesting and humorous characters, and combines a highly imaginative narrative with full page illustrations to engage readers with the story. Aimed at the parent’s children, aged 3 – 10, it is they who become the protagonists for their parent’s learning. The book printed with a run of 750,000 copies and was released a further three times. 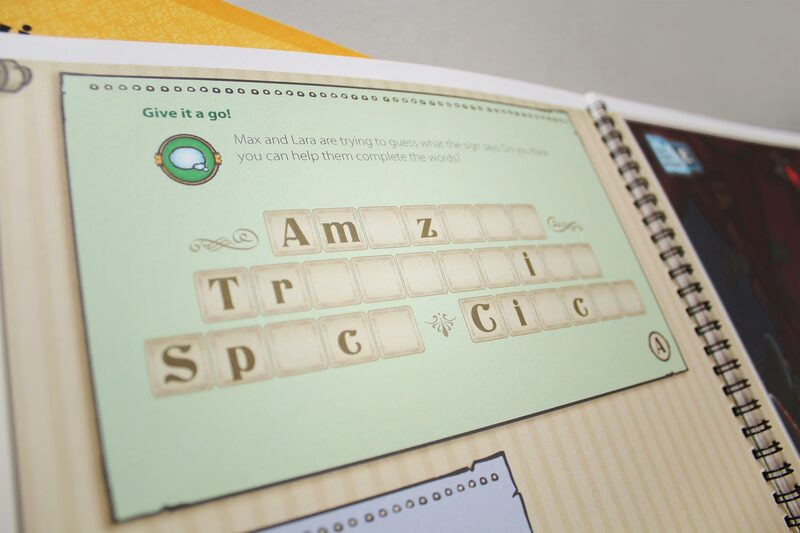 ‘Give it a go’ activities are woven into the plot and are designed as fun exercises for the parent and child to do together. 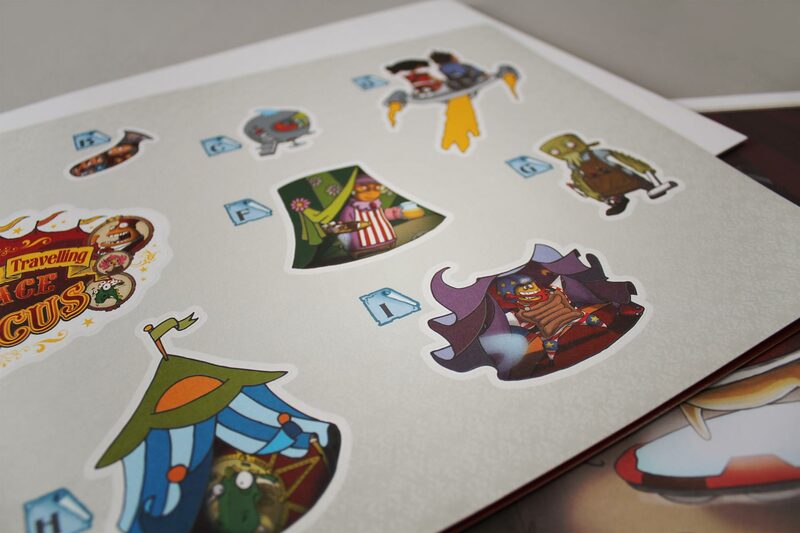 As a reward, stickers can be collected for each completed activity to build up a colourful picture of the space scene on a large wall poster that accompanies the book. Developed in partnership with education consultants from London South Bank University, a framework of over 20 educational exercises established a firm foundation for the fun activities intertwined with story. 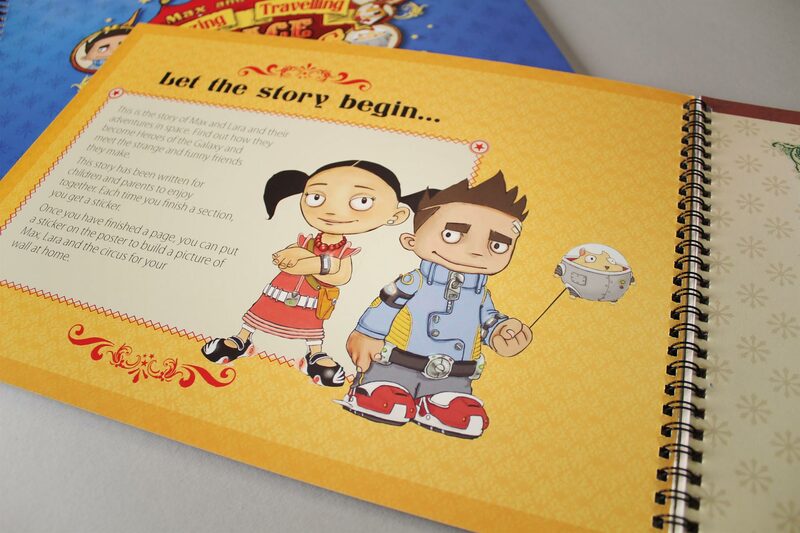 In addition, Firedog produced marketing collateral to support the release of the Parent Pack, to boost uptake by advertising the publication through posters and postcards distributed nationwide. The book printed with a run of 750,000 copies and was released a further three times before being extended across an additional range of short story formats. Masher’s technology allows users to create quick & easy video mashups on the fly within Masher’s website. 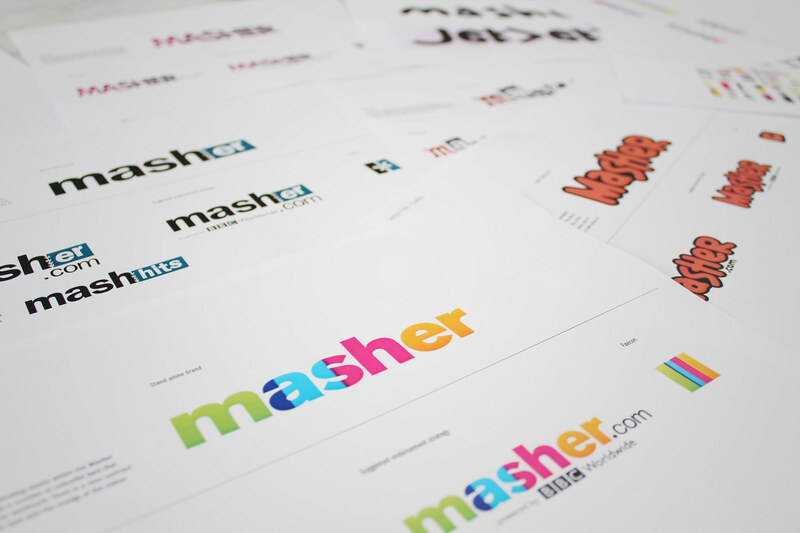 We were tasked with creating an engaging online brand identity aimed to appeal to Masher’s core audience (12-18 year olds). Firedog also delivered visual positioning, messaging and logotype. 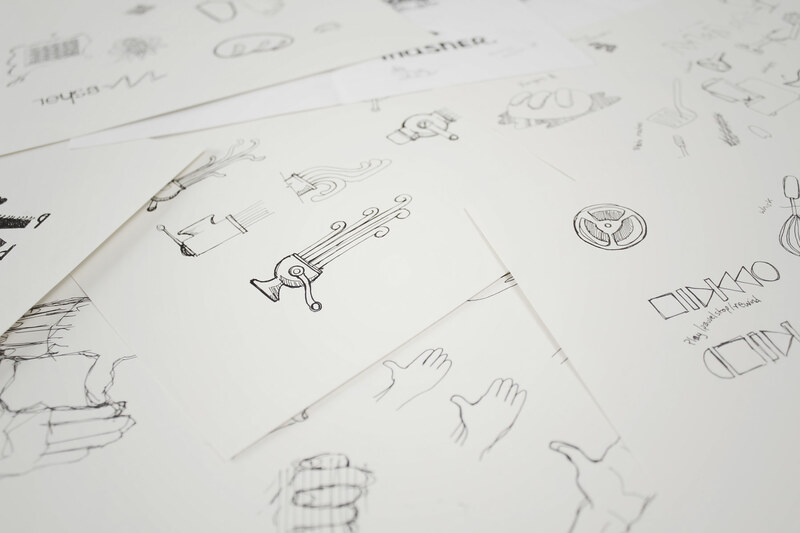 We created a whole raft of logotypes all with very specific visual identities. As the market is typically viewed as disaffected and brand cynical, it was important that the graphical tone was correct and not too cheesy. The final logotype selected uses the principals of slashed up typography to convey the mashing process. The final logotype selected uses the principles of slashed up typography to convey the mashing process that the user might go through. Splicing, hacking and shredding through still images, video, effects and typography in a very fast spontaneous fashion is the given with this brand, so the mark needed to reflect this somewhat chaotic working environment. Mashing is the process of creating unique clips from existing footage, soundtracks and digital still images. 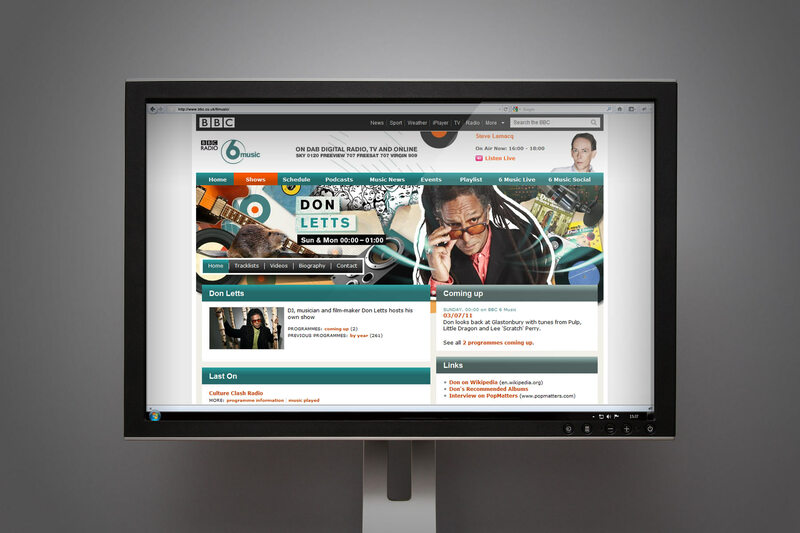 Once the audio and visual content is mashed into place (using BBC’s Masher interface), the user can distribute the mashup clip via their mobiles or social networking sites. This makes it really easy for users to create quick, tactical little clips to send to their friends for birthdays and other occasions. 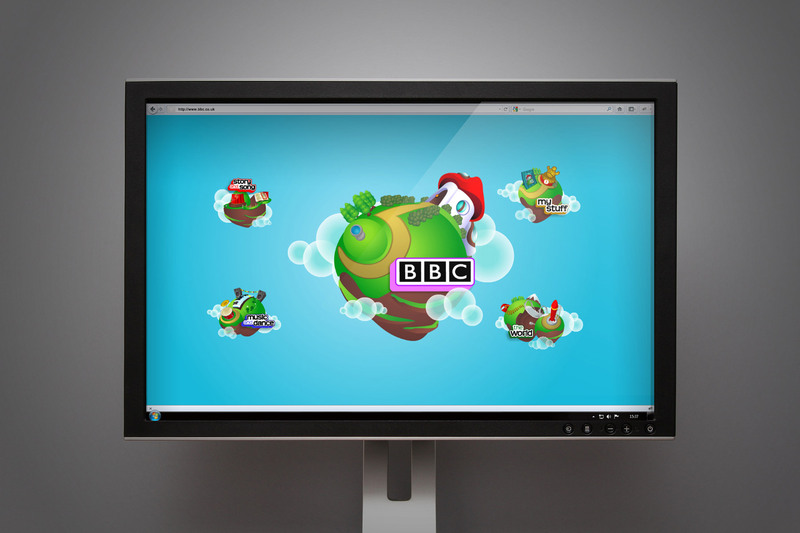 After a consortium of private investors acquired the platform from BBC worldwide in 2008, the business has won a first round investment of £550 K and has won 2009’s Digital Ad Campaign of the year. 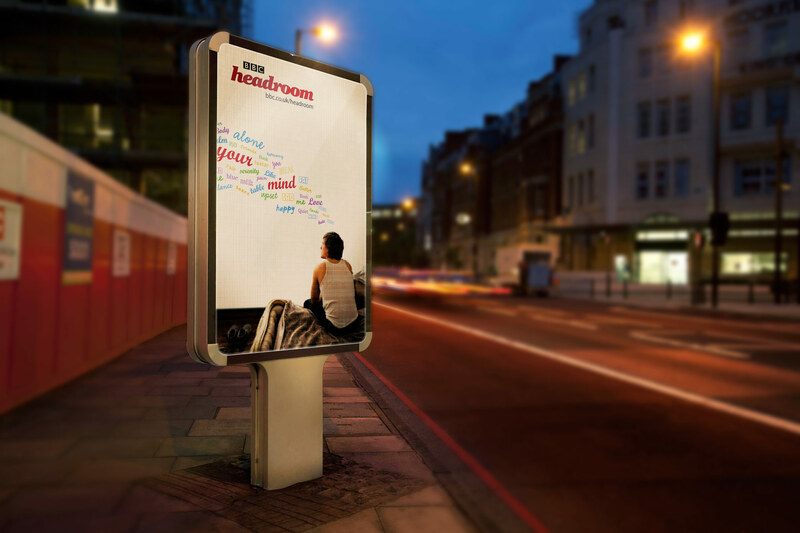 Firedog was asked to originate the brand identity and a look and feel for Headroom, a new campaign for engaging the public with issues of mental health and well-being. 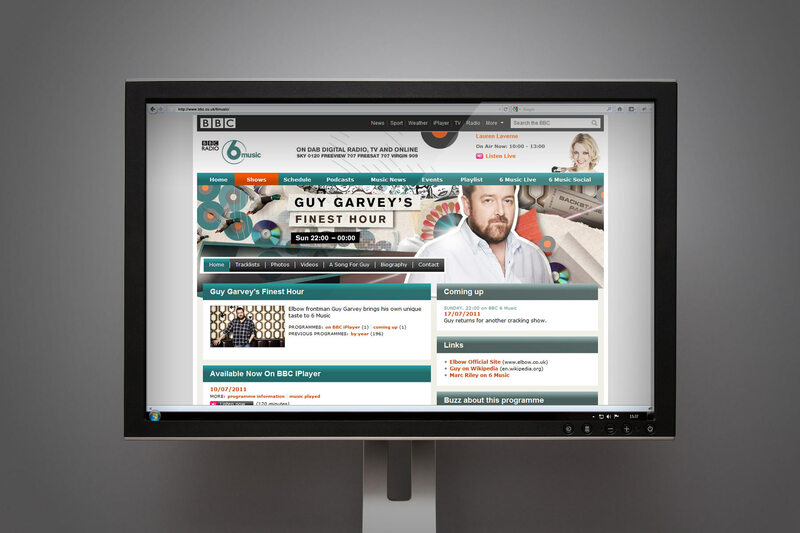 The project required a complete set of guidelines for the BBC’s internal design team to roll out the brand to both on and offline environments within the BBC. Firedog conducted a visual orientation exercise using mood-boards to work collaboratively with the BBC team. This evolved into a strong editorial and visual style for the campaign, built around the strap line, ‘Unwind Your Mind.’ The look and feel used photography of people, carefully shot and post produced to evoke a contemplative mood and sense of empathy. The look and feel used photography of people, carefully shot and post produced to evoke a contemplative mood and sense of empathy. 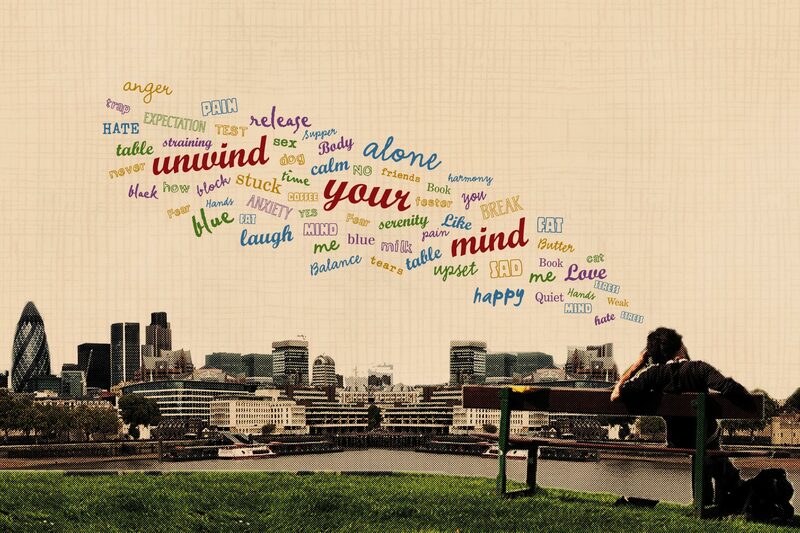 This was combined with thought provoking words floating away from the subject’s head, with contrasting typography to convey conflicts of thought. 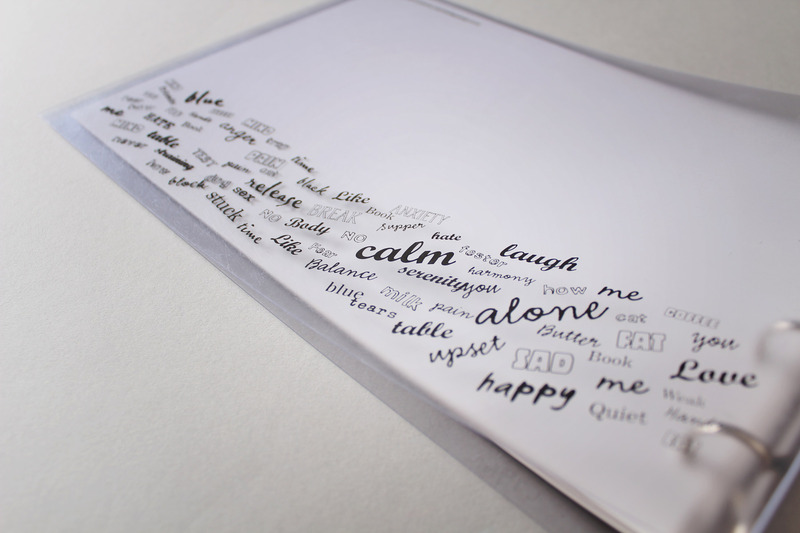 The overall concept was to enable people to project their own ideas and emotions onto the brand look and feel. Firedog developed detailed guidelines for the brand, including the use of the logo across different platforms, and the application of the brand to print and the Headroom website. 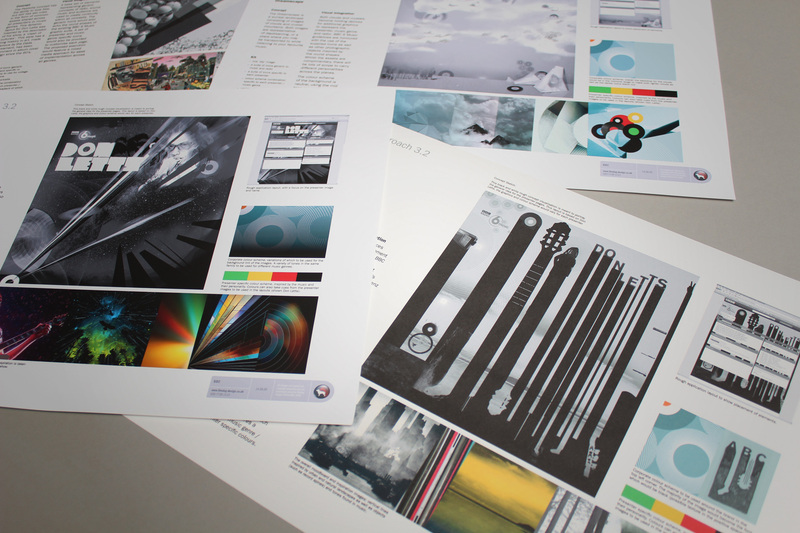 These included tools for the BBC design team to create their own visual communication collateral, including how to post produce imagery with the new brand look and feel treatment. We developed an immersive world in three dimensions, a step beyond conventional flat graphic screens. 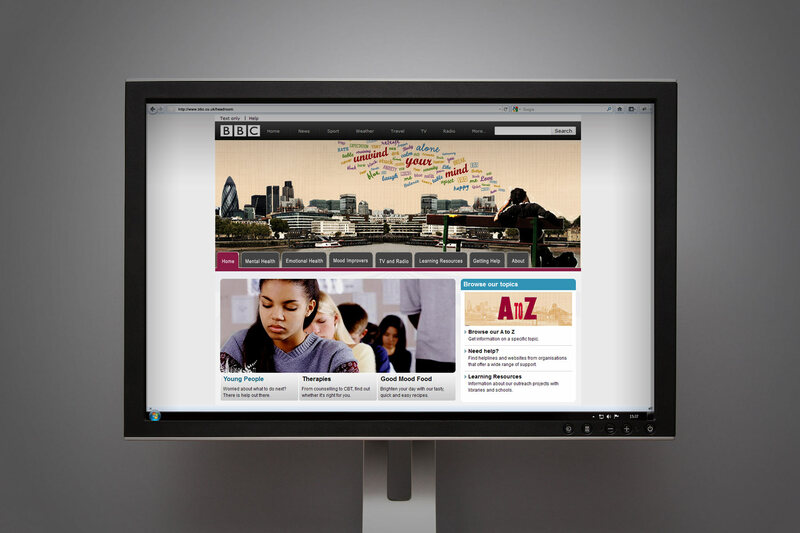 The BBC needed to establish the future direction for delivering online learning content for young people. 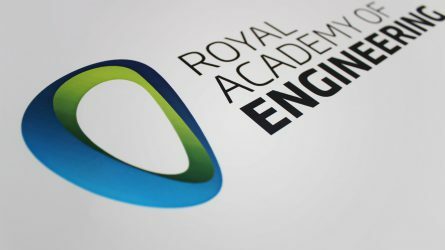 To help by developing prototype concepts that could be extensively tested with three age groups of potential users (7, 10 and 15 year olds). Firedog set about creating three interface sites with individual visual treatments to appeal to the different age groups and based on the concept of encouraging learning through a journey of personal discovery. We conveyed this by developing an immersive world in three dimensions, a step beyond conventional flat graphic screens, where dynamic navigation pulled visitors deep into the content of the site. 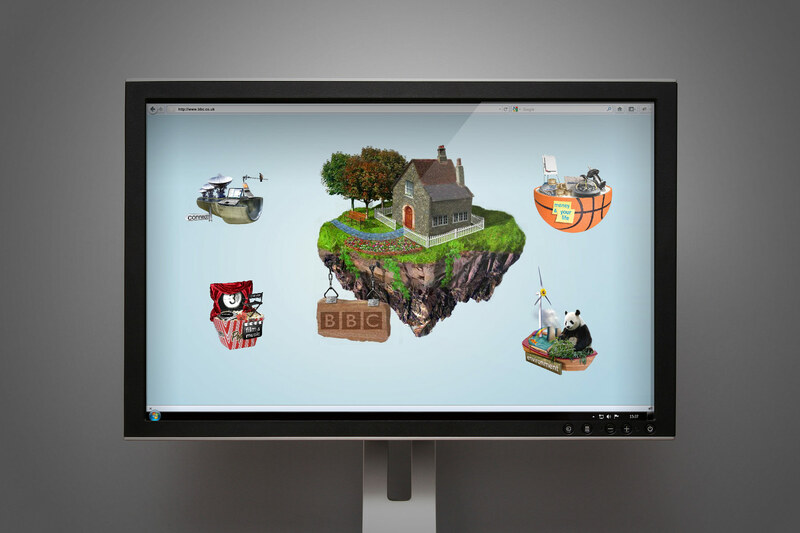 Floating knowledge ‘islands’ were used to represent interest areas such as ‘Environment’ or ‘Technology’ and became bases for rich learning content delivered through engaging animation. Firedog’s quirky interpretation of a virtual world of learning was aimed at capturing young people’s imaginations, with a truly interactive experience liberated from conventional forms of static information delivery online. We developed a 3D navigation engine (using Flash action scripting) which allowed the child to truly interact with the site on a number of levels. 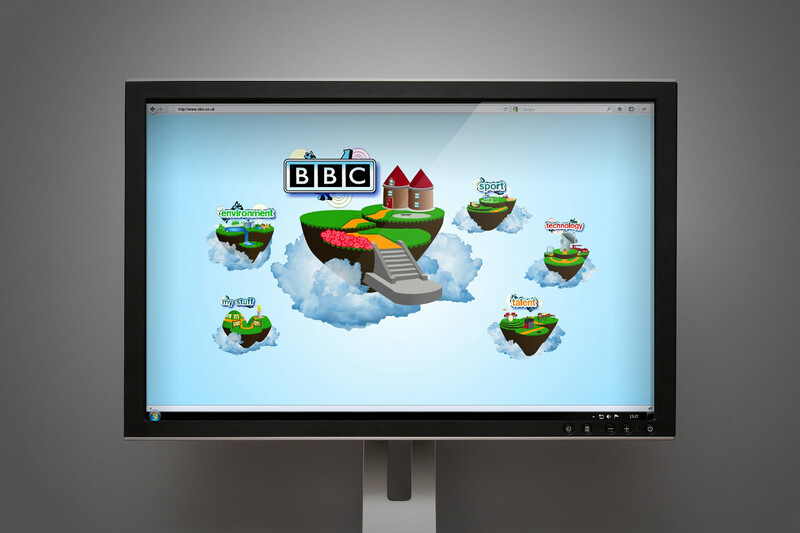 The three sites were launched as prototypes for extensive audience testing to investigate the concept as a potential contender for future of BBC learning online. All respondents immediately engaged with the non-website medium and commented on it’s ease of use and intuitive nature. Firedog was tasked with developing a series of online and mobile assets for Blast in order to create a stronger connect between the Blast brand and their audience. Following our successful Blast branding project with the BBC, Firedog was tasked with developing a series of online and mobile assets for Blast in order to create a stronger connect between the Blast brand and their audience. 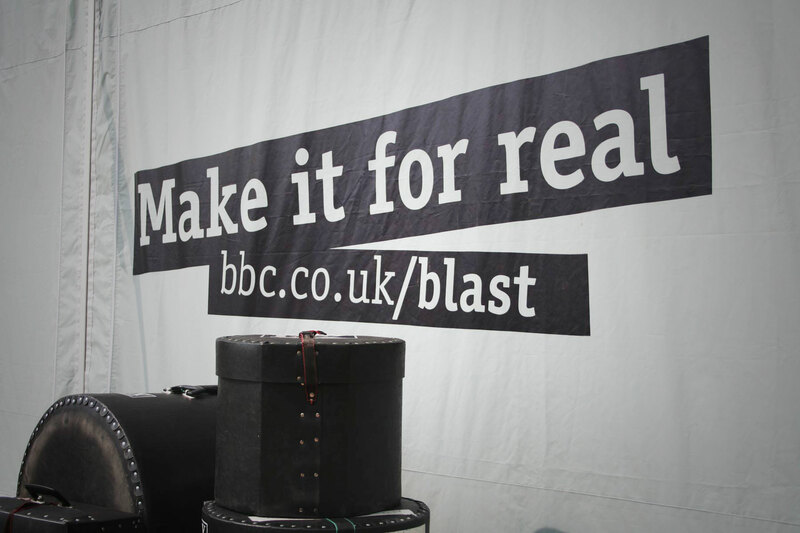 BBC Blast aims to increase its presence in online communities that are popular among the Blast target audience and on young people’s personal creative websites outside the BBC. The rationale was to encourage cross linking to Blast and developing brand awareness within the Blast target audience. This was done through the creation of branded assets for download that have “badge status” and that users will want to download to put on their websites, profiles, mobile phones and social networking pages. To generate ‘ownership’, downloads requiring passwords were created exclusively for people who have visited the ‘Blast on Tour’ initiative. This encouraged these users to interact with the Blast website. The downloads included recognised Blast assets, as well as host of new assets that would ensure a fresh injection of life to the brand. It was vital to keep the audience interested. The initiative met with resounding approval within the Blast community and helped seed the Blast brand across all the major social networks. The film festival featured a collection of short films produced by BBC Blast’s community of talented young filmmakers. A few months after Firedog’s Blast branding project with the BBC, we were tasked with developing a film ident for the Blast ‘Scrap fashion’ film festival. The identity needed to offer a sting, and a series of ‘tops & tails’ used to lead the program into and out of advertising breaks. The film festival featured a collection of short films produced by BBC Blast’s community of talented young filmmakers. Firedog conceptualised a gritty, filmic suite of transitions, animations and clips which could easily be flowed between users content. The moody red curtains acted as flexible frame transitions between a preceding piece of active content and the next. 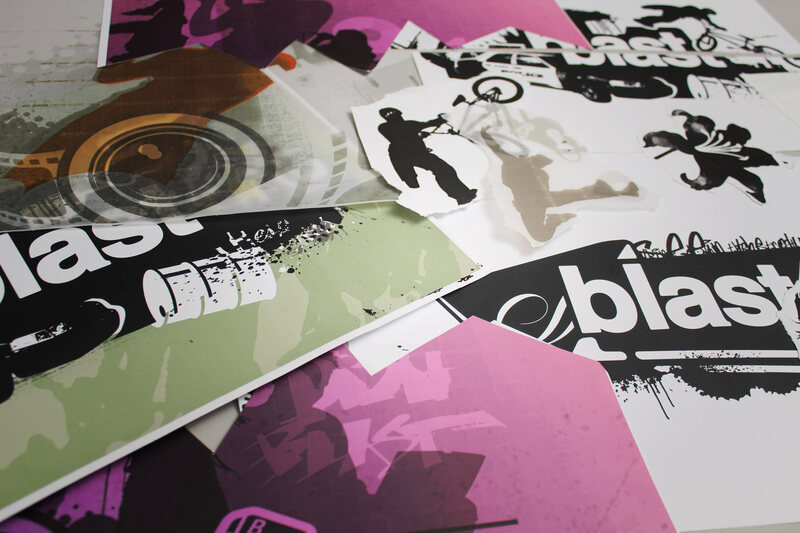 The resulting graphic and grimy look and feel went down a treat at the festival – Creating even more interest from within the Blast community.